Joe Biden leaked Beau’s dying wish, according to Politico. Joe Biden May Have Leaked the Story of His Son’s Dying Wish. Why Are You Surprised? 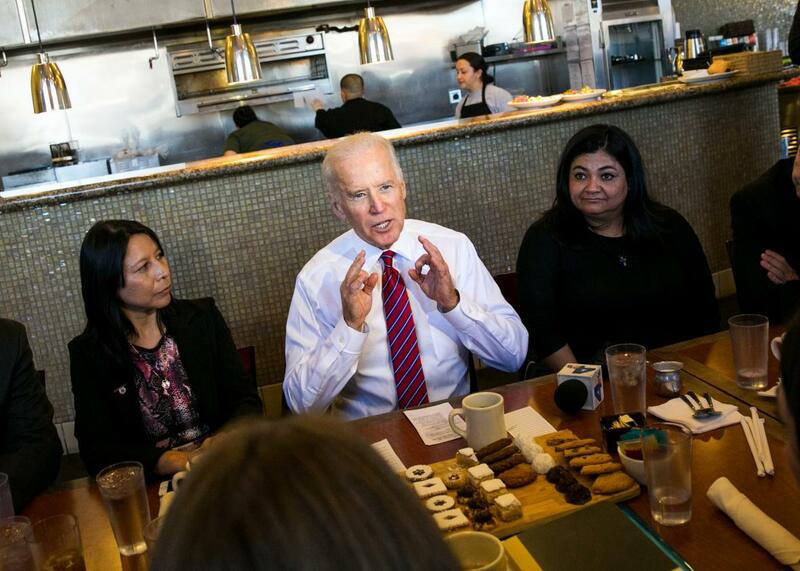 Vice President Joe Biden meets with health care officials at the Homegirl Cafe on Jan. 23, 2015, in downtown Los Angeles. The origin story of Joe Biden’s potential 2016 presidential campaign just got a rewrite—and the vice president’s supporters aren’t going to like the new twist: It seems that … Uncle Joe was a politician all along! It was no coincidence that the preliminary pieces around a prospective campaign started moving right after that column. People read Dowd and started reaching out, those around the vice president would say by way of defensive explanation. He was just answering the phone and listening. But in truth, Biden had effectively placed an ad in The New York Times, asking them to call. The report is based on “multiple sources,” none of which are named or even described in any real detail. Since we don’t know who those sources are—or what their motivations are—we have no way of knowing whether the versions of events being relayed by Politico are true, partly true, or flat-out wrong. Still, given what we do know about Biden, this wouldn’t exactly be an M. Night Shyamalan–style surprise. Let me remind you of three irrefutable things: Joe Biden is an active politician who has been running for one office or another for the past five decades; Joe Biden is a successful politician who has climbed from county council to the second-highest office in the land; and Joe Biden is an ambitious politician who has long dreamed of being—and twice actively campaigned to become—president of the United States of America. While relaying the story of your son’s dying wish to a New York Times columnist in a bid to get people talking about your 2016 plans may seem, at best, uncouth or, at worst, crassly calculated, it’s also a brilliant political move for someone in Joe Biden’s position. And you know who is in Joe Biden’s position? Joe Biden. Even if the veep wasn’t the one who spoke directly to Dowd, it was already apparent that, at the very least, Biden had given his implicit blessing to whomever did do the talking. While Dowd’s un-sourced column launched a thousand What Will Joe Do? stories this summer (and countless more this fall), the revelation that Beau had urged his father to make another White House bid was more than a month old at that point. In late June, the Wall Street Journal, citing its own unnamed sources, reported that before his death, “Beau Biden encouraged his father to get into the race.” That didn’t quite have the emotional punch of Dowd’s intimate description—“Beau was losing his nouns and the right side of his face was partially paralyzed”—but Beau’s quasi-deathbed wish was clearly something Biden’s camp wasn’t eager to keep a secret. If Joe had wanted to quash the story and quell the accompanying speculation, he had weeks to do just that by the time someone relayed the colorful details to Dowd. Likewise, if Biden wanted to do it after the New York Times column went live, he could have downplayed the story or even refused to talk about it. Instead the former-and-possibly-future presidential candidate continues to tell the story to supporters even today. So will the Politico report hurt Biden’s 2016 chances? It certainly doesn’t help. If nothing else, it punctures a hole in the being-called-to-run narrative that is responsible for the veep’s current political halo. In reality, though, that was always just the package that Joe and his allies were offering—politically convenient wrapping that was going to be torn off eventually, be it by Hillary Clinton or his Republican rivals. Yesterday, non-candidate Biden was a grieving father who was being called to run for president; tomorrow, candidate Biden will be just another politician with a personal story (albeit a powerful one) to tell from the stump. Today’s story doesn’t necessarily change that. It’s also worth remembering that this isn’t the first time that the 72-year-old Democrat has benefited from publicly grieving over the loss of a loved one. His first wife and daughter were killed in a December 1972 car crash that also injured Beau and his brother Hunter. Biden famously took the Senate oath of office the following month at the hospital bedside of then 4-year-old Beau. The near-iconic images of that moment remain powerful—but that’s also what made them political. At this point, you can’t tell the story of Joe Biden the politician without also telling the story of Joe Biden the public servant who has had to grieve with the world watching. The fact those two parts of his life are so intertwined doesn’t make his public pain any less sincere or justified, but it also doesn’t change the fact that in politics, pain can be powerful—something Biden knows better than most.